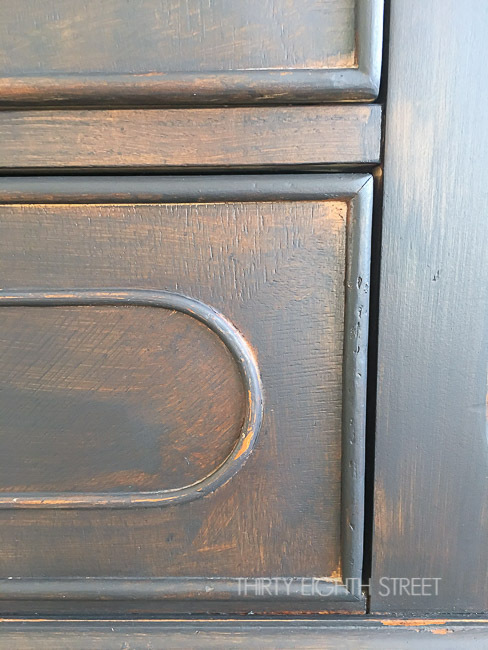 Learn how to give furniture a natural worn and distressed look without using any sandpaper! 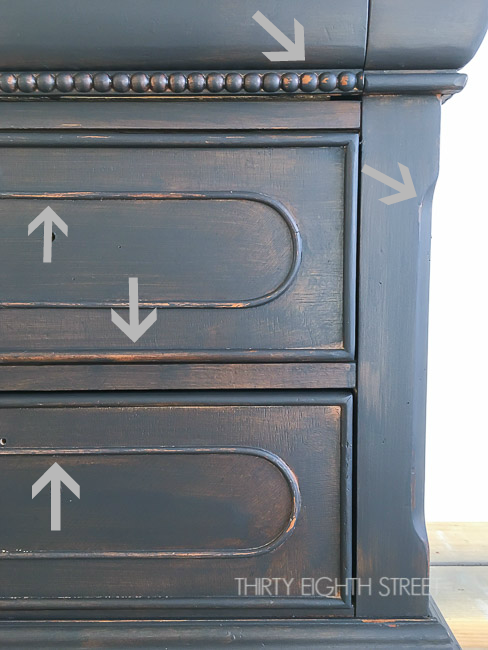 This easy and quick method for distressing furniture works every time! 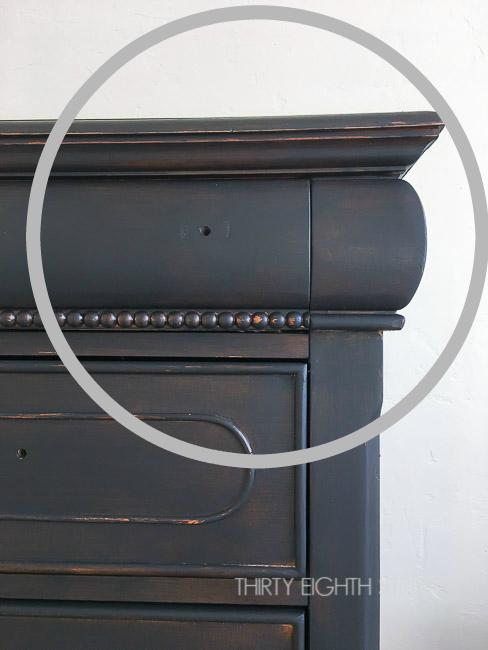 Check out all 7 of our distressed furniture techniques here! Enjoy learning about our natural furniture distressing technique, it's one of the most popular questions that we get asked! I love a good furniture makeover. It's one of my favorite things. 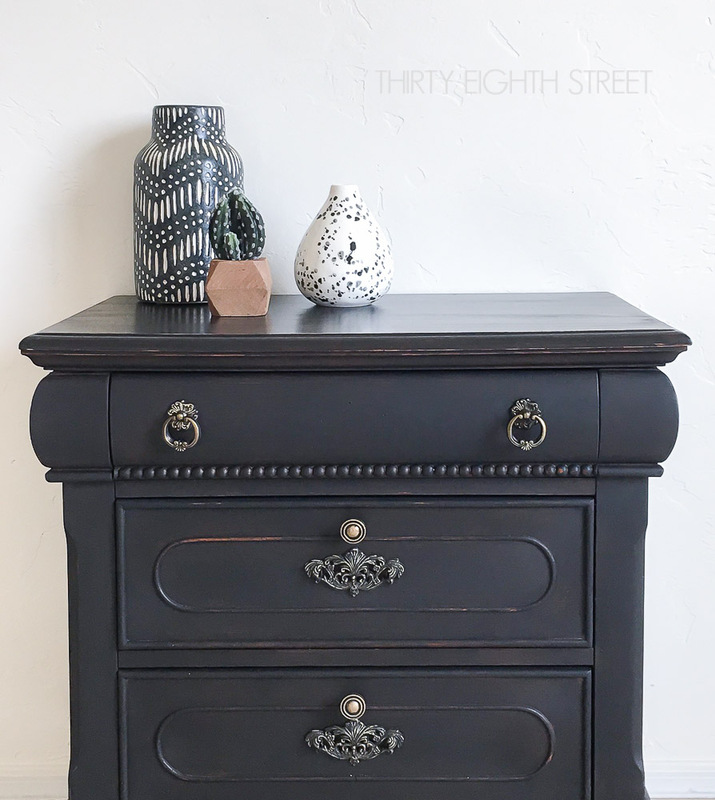 Today, I'm kicking off the first of the year with this classy rustic black painted nightstand makeover that was painted and distressed without using ANY sandpaper! This natural furniture distressing technique is one of my FAVORITE go-to methods to give a piece a naturally aged and worn look! This technique doesn't leave a messy sandpaper residue, it doesn't require wax or vaseline or wire brushes. 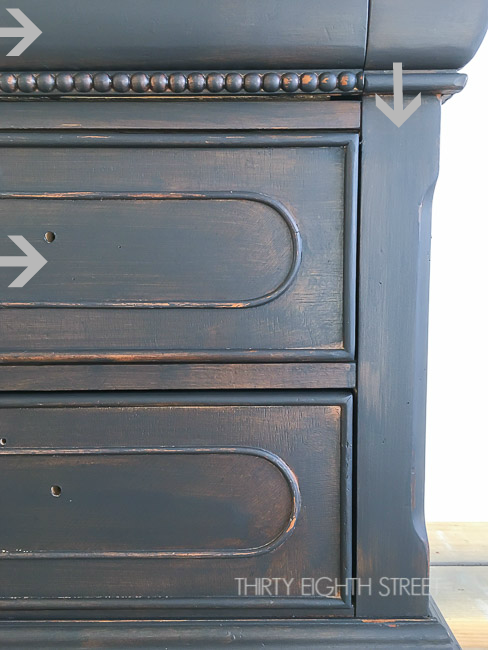 It's an easy and quick distressing technique that leaves furniture looking naturally distressed each and every time! Disclaimer: This post contains affiliate links to products I love and use every day. You can view our full disclosure here. 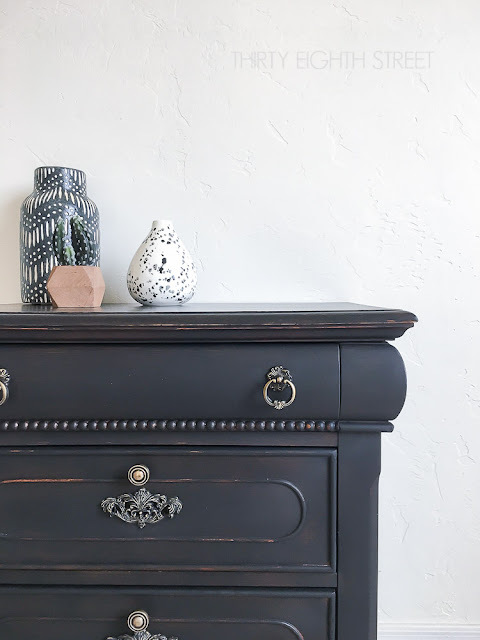 The secret to getting a naturally distressed piece of furniture depends on the amount of paint you put on your brush and the pressure to which you apply it. Wait what?! Yes, you read that right. This is a good rule of thumb for painting furniture period. Several light coats of paint will always adhere and look better than one heavy one! But, it's especially important when we're talking about how to naturally distress a piece of furniture. You want your piece of furniture to receive some light and uneven coverage for the first coat. What do I mean by uneven coverage? I mean that you shouldn't try and cover every inch of your piece with paint. Leave some of the natural wood tones peeking through AS WELL AS leave some of the areas of your piece completely untouched by any paint. Edges, corners, raised areas, insets that have details, and imperfections are some really great examples of where "not to paint". While you're waiting for this first coat to dry meander over and take a quick peek at this Turquoise Painted Bed that I painted so you can see another example of how this natural distressing technique has been used. Step 1 Photo Example: In this first coat, the black paint was applied very lightly. There are some bare spots where the wood finish is exposed as well as large areas where the paint was applied lightly so that traces of the wood finish show through. 30 Fantastic Painted Furniture Makeovers That Will Leave You Inspired! Step 2: Apply Another Light Layer Of Paint To "Focused Areas"
On the second coat, dip your brush so that 1/3 of the paint brush is saturated with paint. Then, scrape the sides of your brush against the edge of the paint can so that your brush isn't dripping with paint. 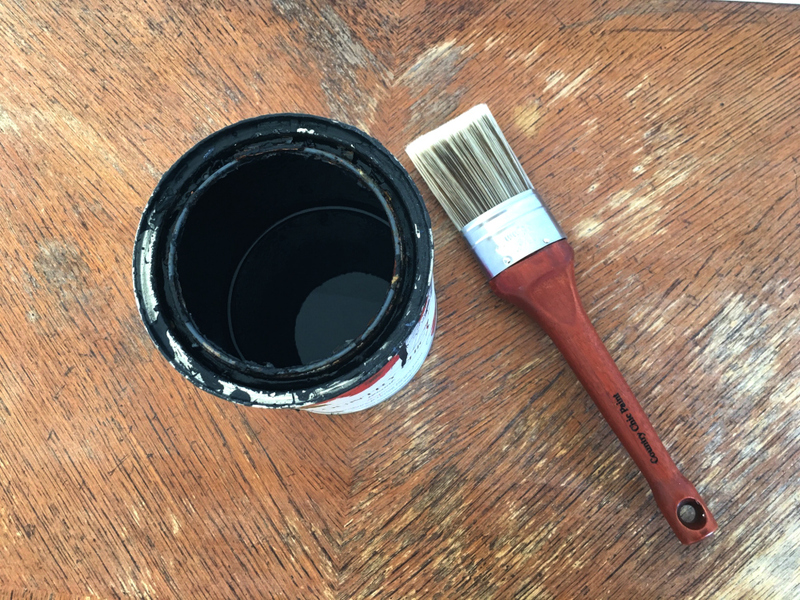 Your brush should have more paint on it then in Step 1 but, it shouldn't be so full that it makes a mess once it leaves the can. Here's where we talk about paintbrush pressure. This next part is really important! After you've dipped your brush into the paint, your paintbrush will be heavy with paint. Therefore, wherever you place your paintbrush on your piece is where you'll get the most saturated coverage. Taking that into account, we can use that to our advantage and be a little bit strategic in our placement. Using medium pressure, give a paintbrush stroke to each of those 3 areas. With each stroke, the bulk of your paint will begin to leave your brush. After you've finished making your third stroke, go back to the first area and with medium/light pressure give 1-2 brush strokes and smooth out the paint. Do the same for the second brush stroke and then the third without re-dipping your brush back into the paint. As you're smoothing out these three concentrated stroke areas as more and more paint leaves your paint brush. Perfecto! Don't re-dip just yet. That gives you the perfect chance to focus on the surrounding areas where your wood is peaking through. Using light pressure, give light dry-brush strokes to the neighboring areas within your 2' square. You want to strike a balance between full coverage, bare wood finish and peek-a-boo areas where the original wood barely shows through. Select another 2' section and repeat Step 2 until you've covered your entire piece with your "second layer". Wait until the paint is dry before moving on to Step 3. Step 2 Photo Example: In this in-progress photo, the following three arrows represent my first three brush strokes. You'll notice that the nightstand is shaded darker in those three areas. Once these areas were blended, I moved to the neighboring areas inside of these arrows and dry brushed over these peek-a-boo areas using whatever paint was left on my paintbrush. When you compare this photo to the photo above you can see how I slowly added additional color while still allowing the wood grain to peek through. Because most of the natural fade distressing is taking place in steps 1 & 2, this step goes lightning fast! Take a section of your rag and dip it into your water and squeeze out any excess. You want your rag to be damp/wet, not dripping wet. The damp rag will remove the paint easily. If you remove too much paint, that's okay! It's an easy fix in step 4. Additional examples of wet distressing can be found on our french provincial dresser or on this painted mirror. Step 3 Photo Example: Here, the arrows represent some of the raised edges/levels where furniture would tend to get scuffed or bumped. These areas were wet distressed. You've layered the paint so that the undertones are peaking through. You've completed the wet distressing process..
Now, it's time to pull it altogether! This last step requires you to stand back and identify the areas of your piece that could use further blending. The goal in this step is to fade the existing wood finish just a little bit more. You'll accomplish this with just a smidge of paint on your brush. Dip your paintbrush so that the first 1/4" of your bristles has paint on it. Scrape the brush against the side of your paint can to remove any excess. You'll use light pressure and long brush strokes to blend and get a nice feathery texture. Step 4 Photo Example: Everything inside of the circle has been blended. The lower part of the nightstand has yet to be blended. You'll notice that by using this distressing technique everything in the top right-hand corner looks naturally worn and weathered without having used an ounce of sandpaper! You, of course, get to control the amount of wear and distressing that your piece will have! This natural distressing technique works for both minimal and maximum degrees of distressing. 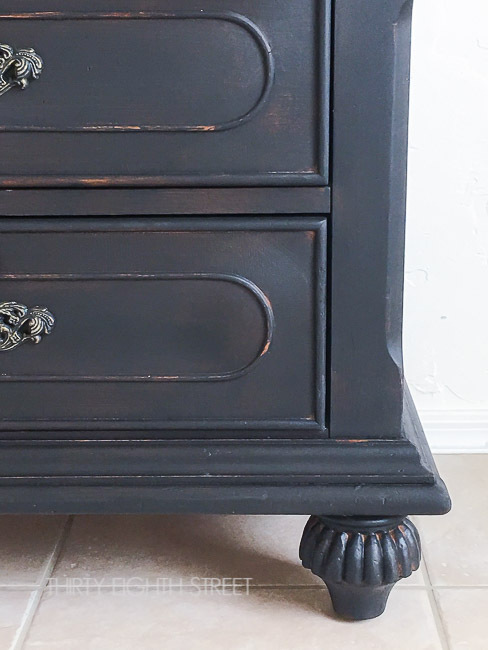 Nightstand makeovers are the perfect sized furniture projects for first time DIY-ers. 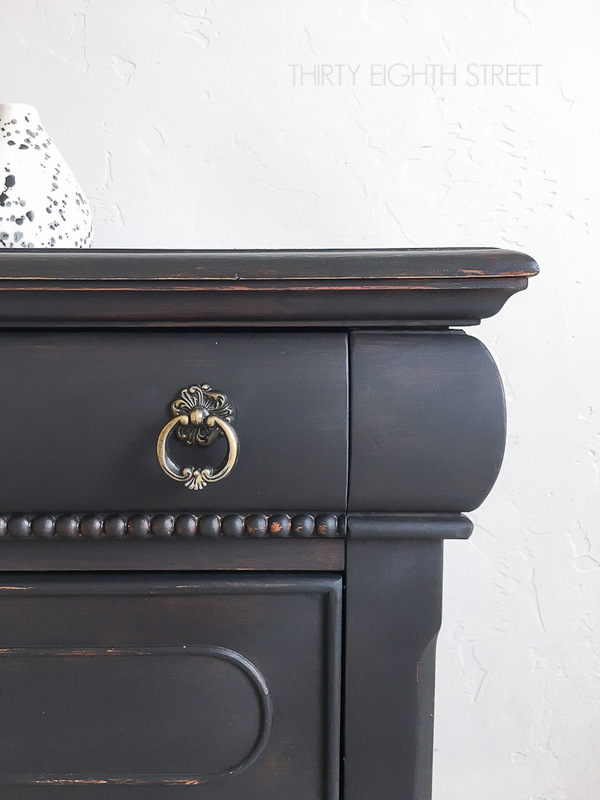 If you've never painted a piece of furniture before, painting a nightstand is a great place to try your hand at painting and distressing! If you liked this article, I would appreciate it if you'd share it on Pinterest or Facebook. 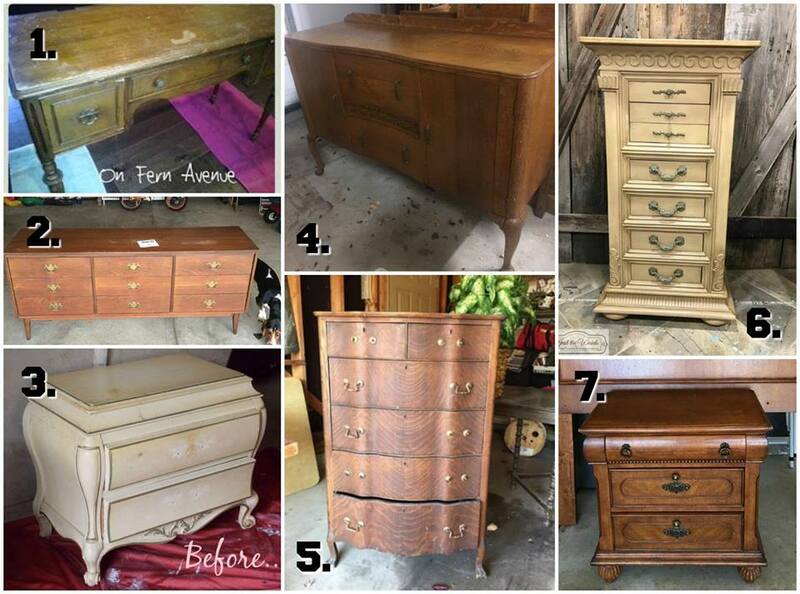 Would you like to learn more tips & tricks for refinishing furniture? Stop by to see these additional furniture refinishing tutorials. Love the weathered look? 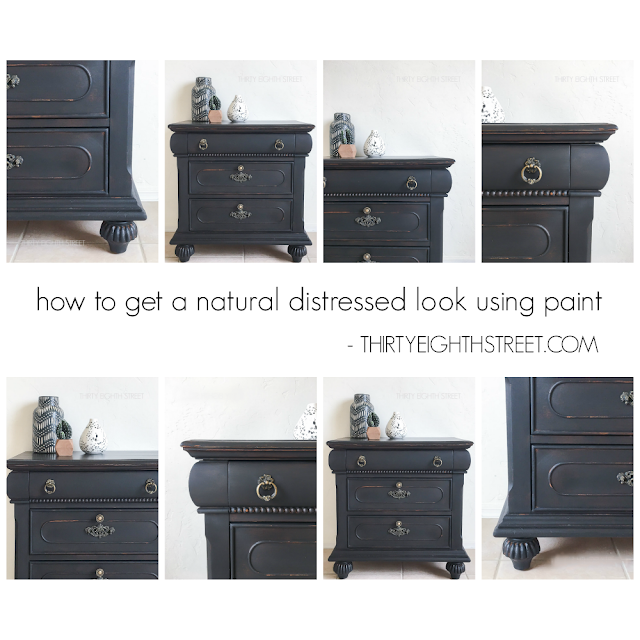 You'll find several other distressed furniture painting techniques here! I'm excited to announce that each and every 2nd Tuesday of every month you'll get to see SIX additional DIY Furniture Projects from these very talented blogging friends of mine! Today marks the first installment of our Crafty Girls & Furniture Friends share party. Click the links below and see what my furniture friends have done with these furniture pieces! Great post w/ great informatio ! Thanks for sharing. So glad you found it useful, Beth. Thanks for stopping by! Great tutorial. Your piece looks beautiful. Glad you enjoyed it, Marie! I appreciate seeing your process. When I distress something, I'm quick with the sandpaper or wet distress technique, but I love your system of layering! I hope you have more of these detailed tutorials in store for us! I think the layering system is so easy. I mean if you're already painting you might as well... ;) Thanks, Colleen! Thank your for your kind words! I'm so glad you enjoyed it! This is great! My daughter has a dresser that we could do this to for her nursery. Baby due in 4 weeks! Yea! Congratulations to you and your family! That is so exciting!! Carrie this is really beautiful. I too am a big fan of dark paint and actually did this by mistake on one of my pieces. Love the effect of the time worn look. A lovely piece too. Pinning this! I love happy accidents! Thank you for your sweet words, Mary! This is a fabulous tutorial! Thank you so much for sharing!! Great tips, thanks so much. Now I just need to find something to try it on! LOL. I hope you do, Robin! Thanks for stopping by! Great post and tutorial! And perfect for my project that I have! I love the colour! Wishing you the best on your project! Great article and love how this turned out! I have a very similar piece I've been looking for paint. Did you use a wax or polyacrylic cot to finish it? Both! 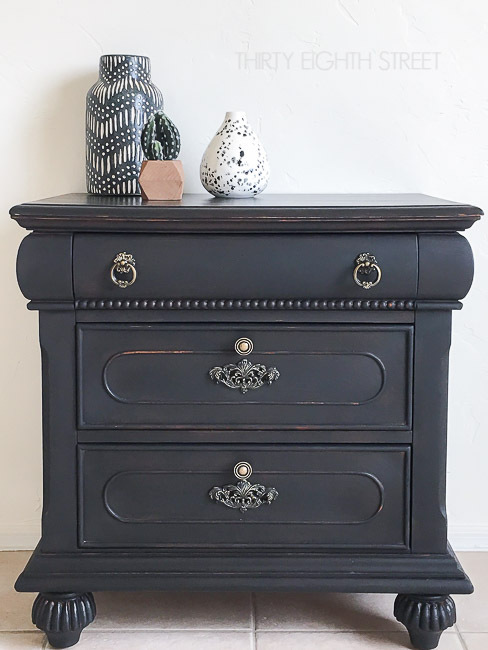 The body was waxed with Country Chic Paint's black wax and the top was sealed with Tough Coat. Best of luck with your project! You did such an awesome job with this piece! Thanks for all of the tips! I'm so glad you found it helpful, Kim! This post is just like a V8 commercial! Smacking myself up side the head as we speak. This is life changing. Have no idea why I didn't work though this on my own, but I never realized this and probably wouldn't have without your brilliance! I am doing this on the next piece of furniture I paint, it looks fun and so much simpler. And really, who likes to sand? Not this girl! Whoo Hoo! This piece turned out gorgeous! Love the method you used to distress. I sure do love chalk paint!! Wet distress = less mess! ;) Thanks so much for stopping by, Kathleen! I'm in total awe of transformations like this. I am so clueless with all things DIY that don't involve cooking lol. What a beautiful sublime soft finish Carrie, with a wonderful tutorial! I will be featuring this project at this weeks Fridays Furniture Fix. Thank you for featuring our work, Jennifer! It's an honor! Wow! Such a transformation! Great tutorial, thanks, makes the process seem easier than I would expect. It is easy, Sarah... a beginner can do it! Diana, thank you for show casing our tutorial at Vintage Charm! Beautiful job and well-done tutorial! So glad Diana featured you this week on Vintage Charm. The finished product immediately drew my attention! Hi Rita! I'm so glad to hear that you liked it! Thank you for stopping by! Thanks so much for sharing our work with your readers! What a gorgeous piece Carrie. But I wouldn't expect anything less. You are so talented. Thanks for the tutorial. I'm absolutely flattered coming from you! I inherited a bedroom set from my parents and need to change up the look. This technique is juat what I was looking for. Your step by step turtorial was very clear and super helpful. I'll be trying it out soon. Thanks so much! My pleasure! I'm so glad you found this helpful.. Best of luck with your bedroom set! Your night stand turned out beautiful! I love the distressing. I have tried this technique on small wood crafts, and signs. But I haven't ever tried it on furniture, I really love the look. Thanks for sharing! It really is the easiest way I know to naturally distress furniture. I hope you get an opportunity to try it out on a piece! I'm a blogger at centsiblechateau.com and we love projects. To say that I look at a lot of them is an understatement. I love painted furniture, and this could be the best piece I've ever seen. I'm OBSESSED! Just wow!!! I posted it on my FB and Twitter, so glad I found your site! Wow! Thank you, Heather! I'm honored. Thanks so much for sharing our work! Do you have to sand the piece of furniture prior to painting? Thanks and beautiful work!! Hi Natalie! I did not sand this nightstand before painting it. I did give it a really good cleaning first though! Thank you, first step by step I could understand, the pics really helped. I have a piece I painted completely, how would you suggest I proceed with distressing? should I strip and start over or sand and work with what I have? I'm glad the pictures were helpful! I'm a visual learner too. You could very easily work with what you have. It will depend on how distressed you want your piece to look. If you're going for a lightly distressed piece, I would simply take your sandpaper along the edges of your piece. 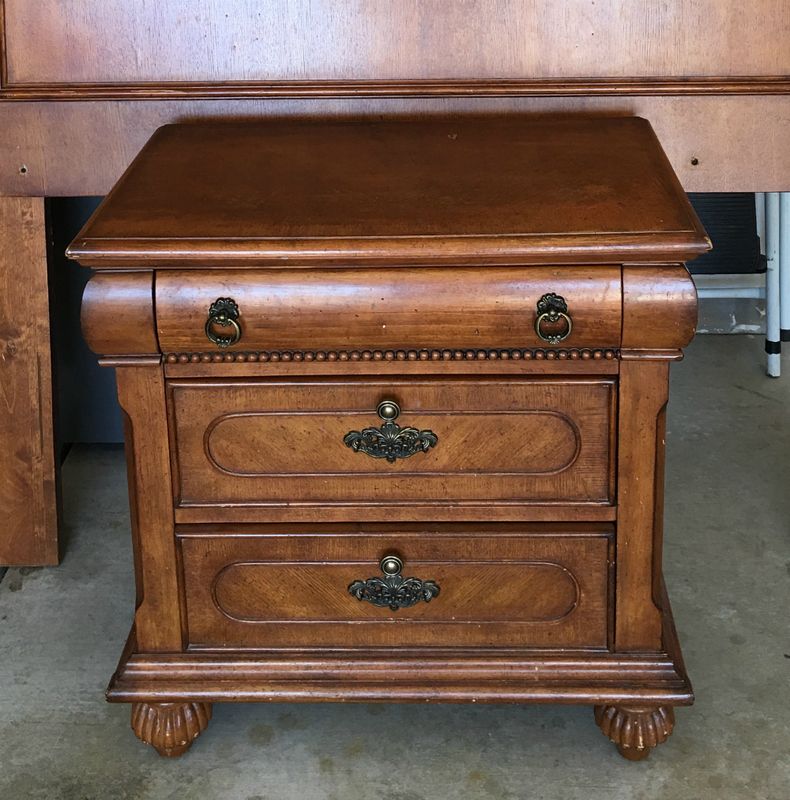 If you want a similar look to this piece you would need to sand your existing paint finish so you have some original wood grain to work with. Hope that helps!